Google-like search experience is so ubiquitous nowadays, that as end users we hardly ever notice it. It allows us to misspell words, expand our exploration beyond the initial scope, or simply provide answers to specific questions. Yet, those familiar with the Tesler’s Law of Preservation of Complexity know that most simple user experiences are in many cases quite elaborate pieces of elaborate design and engineering. This article will provide you with a few examples of the advanced search experiences that are integrated with the Sitecore-based solutions we deliver to our customers, such as SMUD, DWR and DGS. Sitecore Content Search API is responsible for communicating with search engine software such as Solr, a popular enterprise-level platform built on Apache Lucene™. Out of the box, the Content Search API retrieves the basic list of results, which works perfectly if the end user knows exactly what they are looking for. It’s a little less convenient for people who are not quite sure what they need, or simply don’t even know how to phrase the query. SymSoft improves the original Sitecore Content Search API by adding methods that can retrieve other information — such as alternative query suggestion, or query term highlights in the list of results. This creates the user experience similar to the one provided by Google Search. Alternative query suggestion will attempt to search content with the original keyword. In case there are no results to display, it will suggest an alternative query results based on similar existing words or phrases. 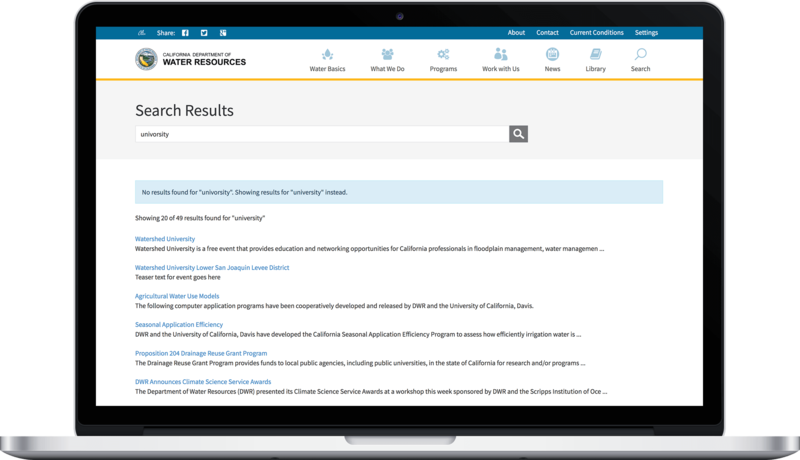 Below is an example of the alternative query suggestion on a live website for the California Department of Water Quality. Stemmed search improves user experience by expanding query to include all results that are related to the base form of the word used in the query. In the example below, using keywords with the same root — university and universities — will retrieve the same list of pages and documents (the root of the word university is universit). Query term highlighting is useful in cases when the search query refers to multiple different contexts. Highlighted query terms help users understand the context around the keyword they were looking up. In the example below, it is easy to find documents that are related to different water management plans. 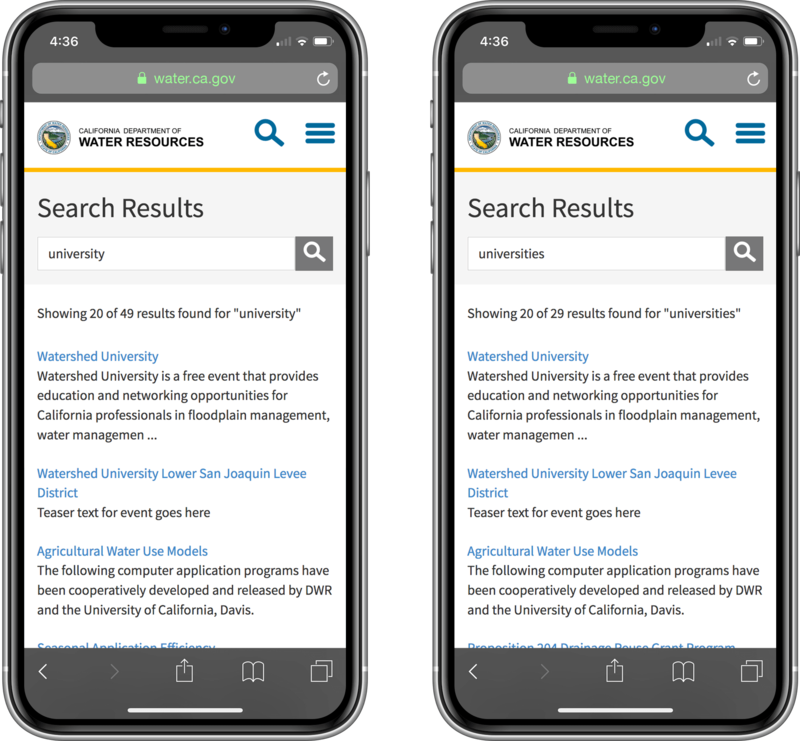 This post hopefully illustrates how different advanced search functionalities can improve search experience for the end user. Furthermore, it demonstrates that a Sitecore-based website can be set up and customized to include advanced search features, especially when paired with a powerful search platform such as Solr.